In a recent bid to have the lawsuit filed by the daughter of the late Aaron Hernandez dismissed, the NFL has, perhaps unwittingly revealed its strategy to kill future brain injury claims. Last week I wrote about how the NFL is attempting virtual time travel to go back and rewrite the chronology of the Hernandez case. Now they seek to rewrite the lawsuit and civil procedure. As I’ve written previously, this, probably more than any other lawsuit is one that the NFL wants to stop in its tracks. It poses an existential threat because it differs from previous lawsuits in an important way. Instead of holding the NFL accountable for their failure to prevent and properly treat concussion and other brain injury during NFL star Aaron Hernandez’s professional playing career, it seeks to hold the NFL accountable for deceiving the public regarding football safety, and the publication of false research to the detriment of young players like 6-year-old Aaron Hernandez. After Hernandez committed suicide, Boston University researchers were astounded when they examined his brain. It was the worst case of CTE they’d ever seen in someone so young. By the time Aaron entered the NFL, he’d already had 15 years of football exposure beginning at age 6. His 3 years in the NFL didn’t cause all that damage. It started much earlier, and Aaron was permitted and encouraged to play football because neither he, nor his family were aware of the risk of long-term brain damage due to the NFL’s fraudulent research and misrepresentations that youth football was safe. The lawsuit filed on behalf of Avielle Hernandez seeks to hold the NFL responsible for her father’s death, and her loss of a father. The NFL does not want this case going to trial. If a jury should decide in favor of young Avielle, the floodgates would open for lawsuits on behalf of others who’ve lost loved ones due to the NFL’s duplicity and those whose brains sustained severe damage through reliance on the NFL’s false assurances of safety. One strategy the NFL is using to kill the lawsuit is to declare both Aaron and Avielle Hernandez members of the class action settlement that is now in its second year of implementation. They seek to categorize Aaron as a retired NFL player and his daughter as a derivative claimant by way of her relationship to him. There’s a big problem with this. Aaron may have been prevented from playing because of his incarceration but he never retired and frequently expressed plans to return to the league when he was exonerated. In my last article on the lawsuit, I explained in detail the NFL’s arguments and how they would have to enter a time machine and rewrite history in order to box Avielle and her father into the settlement. Why a ruling on this may be premature for reasons I’ll explain later, if the NFL should, however, succeed in convincing the court that Avielle is a class member, she will have no recourse whatsoever for compensation. Because Aaron never retired and continued to plan for a return to the league up until the time of his death, she never registered for the settlement and the deadline for registration was August 2017. Even if by chance she was granted a late registration it would do her no good because only CTE deaths that occurred between July 7, 2014 and April 22, 2015 and received a post-mortem diagnosis within 270 days of death are compensable under settlement terms. Aaron Hernandez died on April 19, 2017. The court has made no exceptions to this narrow timeframe. The first players who were diagnosed with CTE, including Mike Webster are ineligible and another player who died at the “correct time” was also declared ineligible because his family did not receive the pathology report until four months past the pathology deadline through no fault of their own. Should “Plan A” fail, the NFL has “Plan B” lined up, and “Plan B” seems poised to strike at any player who may file a lawsuit in the future. Avielle’s lawsuit was filed in Massachusetts state court but consolidated to the concussion settlement MDL and lumped in with opt-out claims at the urging of the NFL. They now argue that her lawsuit is superseded by the Second Amended Master Complaint (SAMAC) for opt-out plaintiffs. This is where my update begins and only serves as additional evidence of the NFL’s attempt to muddy the waters regarding this lawsuit. Avielle isn’t a class member; she isn’t an opt-out, but was shuffled over to Pennsylvania against her will. I read and reread this several times trying to grasp that the SAMAC could be the operating complaint for anyone consolidated to MDL 2323, whether a true opt-out or newly filed case. Since opt-outs specifically opted out because they had their own claims against the league they wished to pursue and had to wait up to eight years in some instances in order to be able to do so, I found this disturbing. Not to mention those who were never involved in the original litigation like Avielle. While they do quote from Judge Brody’s order, and I spent an inordinate amount of time trying to research if and how this could apply and found little written on the topic, in going back to study the briefs again, I discovered what I was looking for—and that is that the NFL’s attempt to invoke the SAMAC is just another one of their diversionary tactics. Avielle’s single claim is loss of parental consortium based on Massachusetts law. Her attorney, Brad Sohn , explains her state law claims in great detail in his brief. Only cases involving federal laws can be tried in federal courts in most circumstances. Little did I grasp at first that the NFL hasn’t established that Judge Brody’s court has jurisdiction and they must do this before they can make any semblance of a legitimate claim that Judge Brody’s order and the SAMAC apply to Avielle’s lawsuit. One way for defendants to move a lawsuit to federal court is diversity, where the parties to the lawsuit reside in diverse geographic regions. This doesn’t work for the NFL. Avielle’s lawsuit was filed in Massachusetts where she is a citizen. For purposes of diversity, the NFL is a citizen of every state in which it has a team; therefore, the NFL is also a citizen of Massachusetts. Since the NFL wouldn’t be able to remove her case from Massachusetts on diversity, they had to present a federal issue, and since there is no federal issue in her lawsuit, the NFL seeks to invent one in claiming that her case is dependent on a CBA, and therefore, the Labor Management Relations Act (LMRA). LMRA serves the NFL two-fold in this instance. Labor cases are always tried in federal courts, and the NFL has had some success in having cases preempted based on LMRA §301. The NFL is attempting to control the narrative by inserting labor related issues into her claim and attempting to portray her case as similar to the early CTE lawsuits that were held in federal jurisdiction because of one CBA question. Their preemption arguments aren’t as wide reaching as they’d have the court believe. Several personal injury cases were cited in Sohn’s response that were not preempted by LMRA in Federal Courts, including the recent Ninth Circuit reversal in Dent. In his brief, Sohn points out the purpose of §301 is for labor disputes to be resolved through uniform federal law and to protect the integrity of CBA negotiated arbitrations which bind union members, zeroing in on the obvious—the young child has never been a member of any union and has no collectively bargained arbitration available to her. The NFL tries to incorrectly insert medical claims that she never pled into Avielle’s lawsuit because they would be entwined with a CBA and subject to §301 preemption. 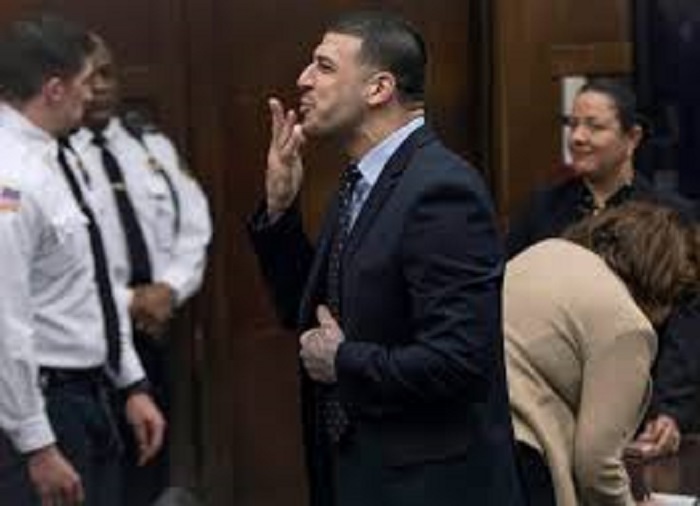 Hernandez’s case could be roughly compared to a lawsuit in which a defective medical device is surgically implanted. The victim could file a malpractice lawsuit against her doctor if she chose to. Or she could also file a personal injury lawsuit against the manufacturer of the device who advertised it as safe. Or, she could do both. It would be her choice. Avielle’s options are similar. She could sue her father’s former employer based on the medical care he received. Or she could file her lawsuit against the entities responsible for falsely advertising and promoting the idea that football posed no danger to the brains of young children. Or she could do both. She chose to file her lawsuit only against the charitable and marketing arms responsible for contributing to deceptive research and influencing children. The confusion comes from the fact all these parties have “NFL” as part of their name, but the NFL defendants Avielle seeks to hold to account are separate and apart from the Management Council involved in CBA matters. While it’s well established that a defendant can’t insert claims that a plaintiff could have pled, but didn’t and this is emphasized time and again by Sohn, in great detail, the NFL seeks to convince the court the plaintiff really didn’t mean to say what she said. They’ve gone so far as to say she’s misconstrued her own claims! Sohn’s recap of Avielle’s causes of action, have nothing to do with Aaron Hernandez’s three years in the NFL. They make no reference to medical care or anything that could possibly construed as related to any CBA. He amplifies this by asking the rhetorical question, “Could a high-school football player not bring each of these claims?” Perhaps it’s not so rhetorical. Someday a high-school player probably will. Currently, lawsuits are filed against youth football league, Pop Warner. The plaintiffs in those cases could probably make the same claims against the NFL as Avielle Hernandez. Whereas mothers chose to assert claims against the youth football organization their late sons who were diagnosed with CTE played in, Pop Warner received funding and guidance from the NFL and serves as a factory for creating future NFL players and fans, so the NFL could feasibly be seen as equally liable . The mothers could have made claims against the NFL but did not, just as Avielle didn’t choose to assert medical claims against the NFL or sue Pop Warner Football. Perhaps the NFL should ask to be added as a defendant in the Pop Warner case, since their reasoning seems to indicate that any cause of action that could possibly be pled should. The league continues to pound the same drum of Duerson and Maxwell that preceded the settlement and pled different causes of action and they strike up that refrain one more time for good measure because it seems to be the only song they know. How are the deceptive marketing and research claims pled by a fatherless child preempted? Where are they reliant on a collective bargaining agreement? If the NFL found the claims of former Patriots’ Ted Johnson to be without merit why did they, on information and belief, enter into a confidential settlement with him and 32-other opt-out plaintiffs? Perhaps the elite attorneys at Paul Weiss have overtaxed their brains in their relentless pursuit of discerning every conceivable means of opposing dementia claims in the concussion settlement. Maybe they should schedule appointments for the free BAP neurological exam they recommend so highly (unless it produces a compensable diagnosis) to see if all their hard toiling over the past two years to discredit players, doctors and lawyers has finally impacted their own cognitive ability. Unless by the unlikely chance they’ve lost their minds, their brief is another shameful attempt to contort reality, wear out the opposition, and with a bit of luck, confuse the judge in order to mitigate the NFL’s losses at the expense of a child who has suffered grave harm. 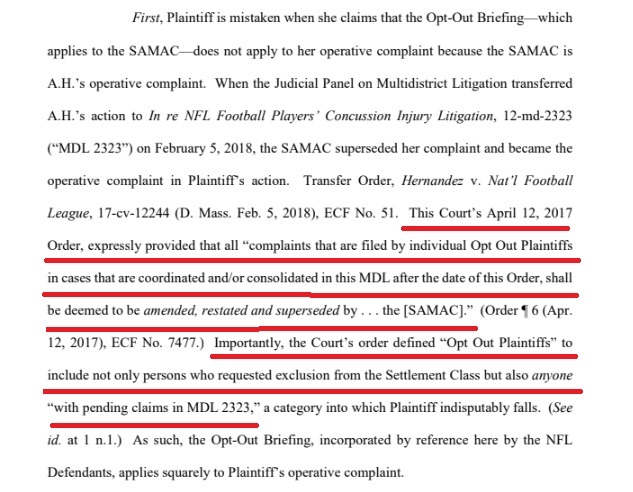 If Judge Brody is able to cut through the NFL’s subterfuge in falsely trying to claim federal jurisdiction, as well as application of the SAMAC to a non-federal case; their attempts to insert claims from the SAMAC which has no relation to her since she is neither a class member nor an opt-out into her state law complaint to invoke LMRA §301 preemption; and attempting to alter the timeline of her father’s eligibility and intent to continue a professional football career, then she should grant immediate remand. Hopefully she’s savvy enough not to fall through the trap-doors set by the NFL in this suit as well as their illegal appeals of her own appointed Special Masters’ non-appealable findings of fact in the settlement. Despite their words claiming to want to pay “legitimate” claims in the settlement and then fighting against them at every turn, and now setting up a house of mirrors to confuse the issues in Avielle’s lawsuit the NFL is proving Avielle’s allegations of deceit. It seems nothing has changed outside a cosmetic makeover since the time the NFL’s MTBI committee published the research that deceived her father. It would definitely be overreach here. 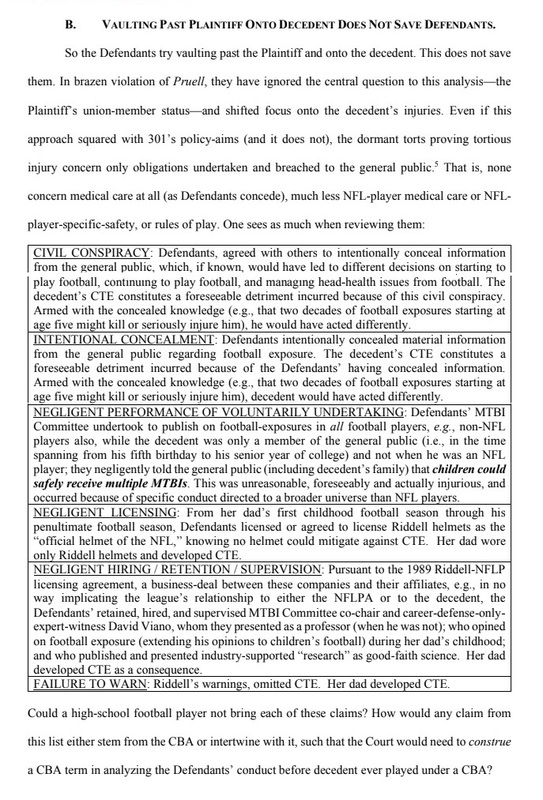 The NFL’s arguments against Avielle Hernandez likely preview what future litigants will face when they attempt to seek accountability from the NFL. The league should be ashamed of such posturing. Just as in Avielle’s case, the NFL will likely assert the SAMAC as the operative complaint. I spent an embarrassing amount of time in a quest to find out just how controlling the SAMAC is over other lawsuits in the MDL. While it turned out to be a non-issue for her, if future lawsuits involve federal questions, it could be a factor for them. It seems a given that the NFL will seek to remove future lawsuits filed by players to the Pennsylvania MDL. If their claims are entirely based on state law, as Avielle’s single demand is, they will need to fight a jurisdiction battle. They will have to be prepared to defend against the NFL’s preemption arguments since we’ve seen they will assert preemption whether any arguments hinge on a CBA or not. They will also have to be careful to stay on point and on track. Just as I devoted far too much time in pursuing their baseless SAMAC assertion, I’ve observed lawsuits where defendants took control and plaintiffs devoted excessive time and resources to navigating the defendant’s maze rather than developing and asserting their own arguments. “A little child shall lead them,” is a theme derived from scripture and often applied to young movie heroines who overcome great odds, guided by wisdom and determination. With the help of her legal team, perhaps young Avielle will lead the way for the many people who’ve experienced loss and suffering due to the NFL’s callous deceit.